Subscribe to get the latest Beadwork News and great inspiration on an ongoing basis. To read previous newsletters click on links from this website. Rypan Designs a great source for learning how to beadweave your very own creations. Follow Maria’s clearly illustrated instructions in contemporary beadwork kits, patterns and books. Expand your appreciation of global folk arts. Maria Rypan is a designer, artist and publisher of beadwork instruction books and a recognized expert on ‘gerdany’, the Ukrainian-style of beading. 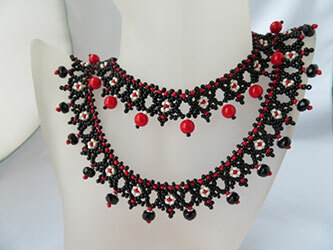 She enjoys transforming everything from seed beads to new bead shapes into designs. Her work is featured in many beadwork publications. Maria has taught beadwork classes internationally since 1995 at various shows, retreats, museums, shops and bead societies. Keep an eye open for learning opportunities. M07-XO Fun variation on the X&Os theme. What a difference a change in focal beads makes! Winnipeg, save the date!! Kits and patterns are packed! I’m coming to the Oseredok, Ukrainian Cultural Center with a presentation and workshops May 12-13th. Fri, 6:30 pm, I’ll be presenting a visual overview of historic adornments by ethnographic regions first. It’s a great intro into enjoying the current trends and contemporary creations from Ukraine. Sat, May 13th, is your chance to learn beadweaving hands-on in two sessions or all day for one more involved piece. For more details, see Oseredok. Be sure to register. Looking forward to meeting and beading with you!! Afterwards, my husband and I continue our road trip to Denver for a wedding. There should be loads of inspiration for the next newsletter from our month-long circle tour! So far 2017 has been amazing with unique opportunities to share my passion about beading and adornments of Ukraine with the people of Chicago in “Gerdan-Talisman of Triumph”. Then I had an opportunity to share that presentation and fashion show beadwork in Kyiv on Mar 31st at the exhibit “Beads. Yesterday. Today. Tomorrow.” See both in newsletter #55. A selection of netted styles: is available as downloadable patterns for $8.95 each. Within minutes of payment by Paypal you get a PDF with step by step instructions, a supply list, photos of other colour ways for inspiration and a finishing tip sheet. CraftArtEducation: Preview my online class. Netting Primer is fully narrated with excellent photos of the steps in three parts which can be stopped at any time and replayed for your convenience. It’s an excellent opportunity to have my personal assistance and instruction for a small price in your very own home. Preview it here. Click on the link to the blogs anytime. Peruse through the “ABC’s of Creativity”. See Kits in a separate section in the Catalogue for Rypan Designs beadwork kits and printed patterns. “Buy 4, get ONE* FREE” SPECIAL (*lowest price item, books excepted) applies at shows and online. Visit the Gallery and be inspired! See Maria's own Gallery, Student's work & Wedding stories complete with photos and kit references. Enjoy the eye candy and stories. Peruse my Portfolio to see projects, published articles, presentation and seminar topics, plus what’s happening in the press. Learn How To Diagonal Weave Using Triangle Beads from my YouTube video. I show how to beadweave using two very different shapes of beads into a fun tennis bracelet. Be sure to see “Walking With Our Sisters", a commemorative art installation for Missing and Murdered Indigenous Women of Canada and USA. It is traveling around the North American continent for several more years. My moccasin vamps are part of the 1725 pairs beaded by 1372 artists. Check their website to see when the installation will be near your community. It is very worthwhile spiritual experience. 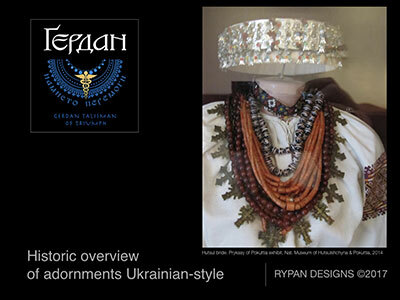 “Historic Overview of Adornments Ukrainian-style” is a tightly edited tour of all the ethnographic regions of Ukraine. It’s an excellent source of seeing the styles of metal and beadwork adorning folk costumes throughout Ukraine. This is a great companion to a appreciating a contemporary beadwork presentation. “Pysanky of North America” was created to show at the Pysanka Museum in Kolomyya, Ukraine before I presented them the pysanka-shaped coin issued by the Royal Canadian Mint on May 31, 2016. It shows the amazing pysanka eggs created in USA and Canada in all shapes, sizes and at a variety of venues. “Contemporary Prykrasy (Adornments) in Ukraine III” shows the latest trend in beadwork since the Maidan Revolution. There’s a lot of 3-D florals and a return to traditional adornments. This covers 2013-2016. "Beader’s Paint Box" is a demonstration of colour theory and design for your bead projects. Since you cannot blend beads like paint, you’ll see how to effectively use bead finishes and colour placement. “Pysanky & Traditional Dress of Ukraine” debuted Mar 2013 at the Regional Pysanky. The images are all new. Mostly from the Museum of Decorative Folk Arts in Kyiv. This presentation has the best combo of ‘pysanky’ with dress and folk arts of particular regions. Book it anytime because the costumes and ‘pysanky’ are timeless. “Gerdany — Ukrainian Loomwoven Patterns”, is a visual show of how four different styles of loomweaving are created. Best way to learn is to book a Loomwork Series with custom-made wooden looms and choice of four RD Medallion and Swag patterns or kits. “Beadwork: THE Most Versatile Art Form”, an inspirational seminar launched at Creativ Festival, and shows a good variety types of beading. “Embellishing your World: Beading and Surface Designs” can change your world. “Reinterpreting Nature: Adornments & Decor” is the latest eye candy edition combing all sorts of nature-inspired art, craft and architectural detail with beading. Curious?? I’d love to show it to your group. “Tour of Gerdany Regions of Ukraine” comes with a companion “Ethnographic Regions” travelogue which gives a wonderful overview of Ukraine. I found it gives greater appreciation for the beadwork featured in the “Gerdany Beadwork Tour”. “Contemporary Beadwork in Ukraine II” shows a variety of ways beads are used in creating jewelry, decor and in making beaded pysanky to 2012. Photo Album of the “White Aster of Love” Book Project (1989 to 1992 and beyond)” is about a unique embroidery and poetry project by dissident Iryna Senyk and a Women’s League in Toronto. Truly inspirational and ready to show anywhere. CLICK on Presentations and Seminars for more details. I come ready to teach beadweaving or loomwork.